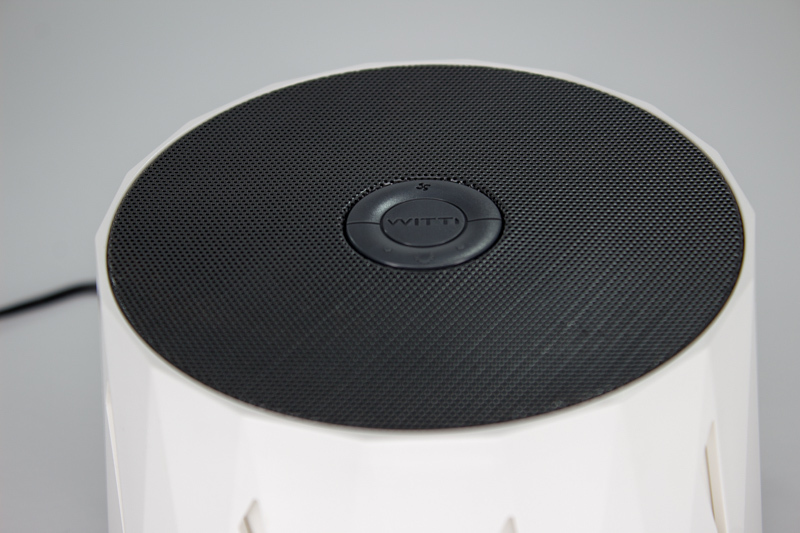 Witti’s Dozzi is a white noise machine whose sole purpose is to help you (and your baby, fellow parents) get some sleep. As someone who suffers from insomnia I leapt at the chance to review this gadget, daring to dream I’d get a better night’s sleep. I wasn’t disappointed. 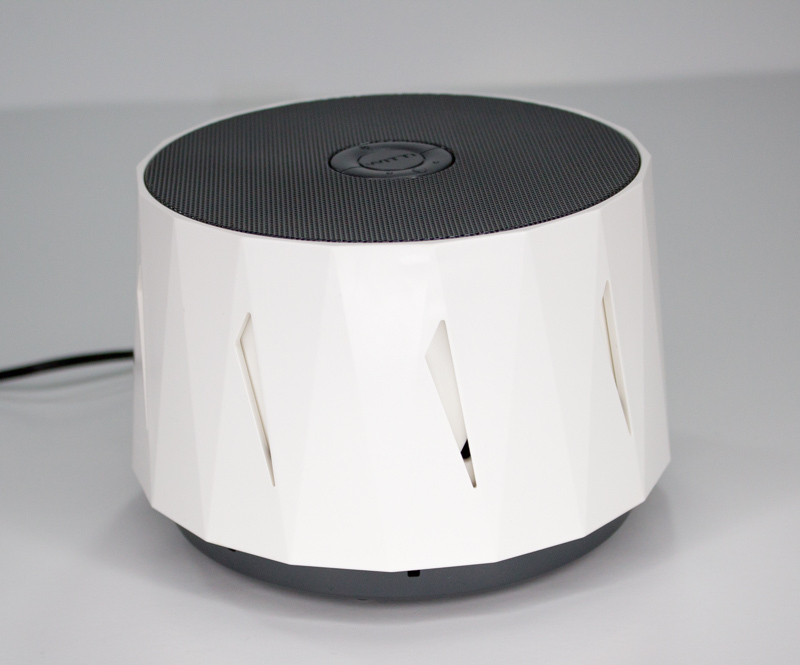 If you’re unfamiliar with white noise machines, all you need to know is that they’re designed to provide background noise that either drowns out or minimizes other noises. They’re practically mandatory if you’re a light sleeper. This particular one is an interesting gadget because it’s not smart, doesn’t have an app, and doesn’t use recordings. Yet, it does have a 16 million-color LED light and a USB charging port for your phone or other device. Witti has a tendency to make interesting devices that ultimately prove thoughtful – if not still a bit weird. But we like weird. I can’t quite put my finger on what this thing looks like. I keep thinking it reminds me of a building – something like the Coliseum – or that maybe there’s another older gadget it resembles. If any of you readers can spot its doppleganger in another object email me. I dig the Dozzi’s looks, for the most part. Once I set it on the night stand, with its gorgeous under-lighting in whatever-color-I-feel-like, I really liked the way it looked. The 16 million-color LED seems pointless until you settle on a color you really like and then: It’s a cool addition. You may not need a white noise machine that glows like Paul Wall’s trunk, but don’t you deserve one? But who cares how something that’s supposed to help you sleep looks? It’s got two buttons on top that are easy to find. One cycles the fan through three different speeds, the other turns a white light on, makes it dimmer, or cycles through 16 million other colors. On the side there’s a USB charging port for your phone – a thoughtful and immediately useful inclusion. There’s also a switch that lets you easily set a 60 or 120 minute sleep timer. Everything is easy to find and use – important for a device you might fiddle with in the dark. 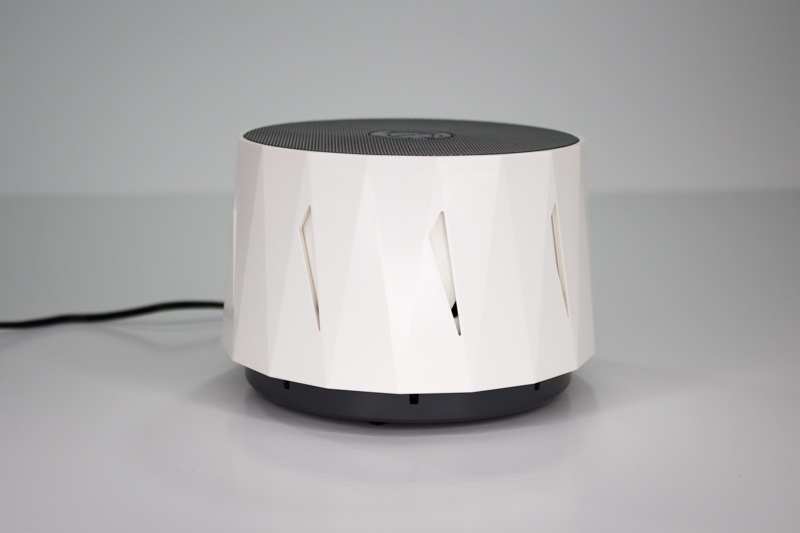 The Dozzi uses a fan with several settings set inside an adjustable housing to provide ‘authentic’ white noise. Turning the housing allows you to ‘shape’ the sound of the fan by controlling the airflow. This is in contrast to the ‘digital’ white noise provided by apps or many other machines. Personal preferences will vary, but there’s a definite difference in the way a real fan sounds versus a pre-recorded one. I much prefer the Dozzi’s sound, on any setting, to any digital white noise I’ve heard. That’s not to say it’s the answer to every sleepless dreamer’s prayers. I did find that it wasn’t quite enough for me. I need a little ‘oscillating fan’ sound or thunderstorm in the mix to sleep through the clamorous sounds of my neighborhood. However, without a doubt both my fiancee and I have slept better with the Dozzi playing along with Google Assistant’s digital thunderstorm noises looping, than with any other combination of white noise sounds previously. Parents will be happy to know that, at least anecdotally, I can assure them the Dozzi helps young ones sleep through the night. We still use Bleep Bleeps’ excellent Suzy Snooze for soothing music and light to help our toddler fall asleep, but once the music stops we turn the Dozzi on. Power users may want a device that has a bigger variety of sounds than just “adjustable fan noise,” and there are free options available for people who just need some random noise. But, for people who live in incredibly high-noise areas – I have train tracks on either side of my home, each within a block – I recommend this over relying on digital sounds alone. If you’re a light sleeper, and you haven’t already found the fan of your dreams, consider this one. I couldn’t find anything not to like about it because I was too busy getting some much needed rest.